The Villa is located in a strategic position to grasp the hidden secrets and valuable artistic heritage of Tuscany and Umbria. The living room is simple and sober, starting with ocher walls where there is the fireplace, where you can enjoy the surroundings, this LCD TV, DVD player and free Internet WI-FI. The porch and kitchen are one connected, you can eat outside and enjoy the view of the valley. On the ground floor there is also a bedroom and a bathroom with shower. offers a family atmosphere will, thanks to the availability Que core runs the house, great place to ask and express opine on the entire area, guided tours, wine tours, visits to the art cities, etc .. The nearest town, with many restaurants and shops, is only 3 km and cultural centers such as Cortona, Arezzo, Montepulciano, Siena, Florence, Perugia, etc. They can be reached in under an hour. Did you know that in Tuscany there are seven UNESCO World Heritage sites and more than 15 in central Italy? Some world famous such as the historical center of Florence and Siena, the Piazza del Duomo in Pisa ... and off the beaten track, such as Assisi, Spoleto, San Gimignano and Pienza. From the villa you can be reached in less than an hour all the most important and famous towns, wineries, medieval villages. Hello everyone, my name is Giuseppe. I am a curious and cheerful person. Our family is lucky enough to live in one of the most beautiful places in the world: the Tuscan countryside. I know every corner of these hills, I'll be happy to show you routes and unusual places and reveal some little secret. We like guests in our villa between Cortona and Arezzo, surrounded by olive trees and vineyards which I manage personally. We love to share our knowledge and experiences with local people from all over the world. 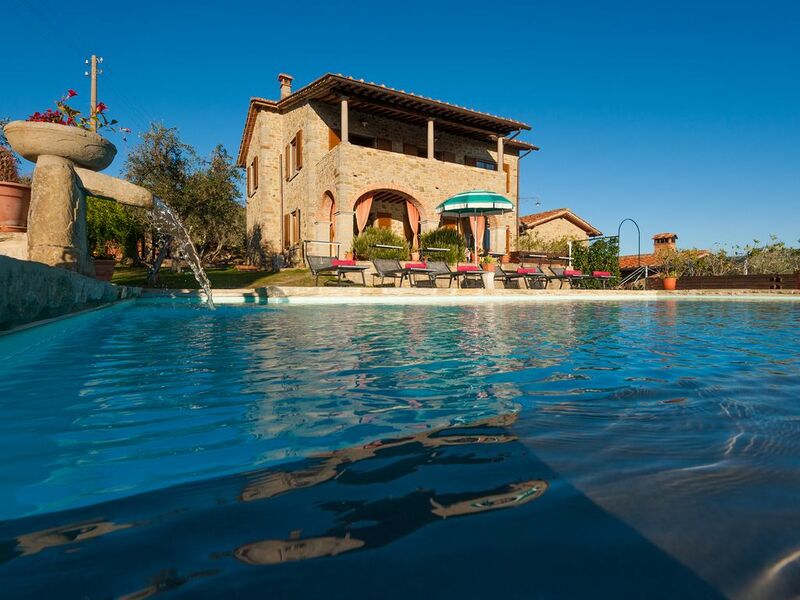 Villa Senaia - Welcome in Tuscany In the stunning Tuscan countryside, along its endless artistic heritage, where stretches of silvery olive trees stare after vineyards and cypresses, you will find Villa Senaia. An ancient stone farmhouse, located in a strategic position where it is easy to uncover many of the hidden and characteristic secrets of Tuscany and Umbria. The local atmosphere will leave you with unforgettable moments of quiet and relaxation, enjoying scents, colors, and unique sunsets. Excellence comes in many forms, but having spent many a happy week or two in Tuscany I can only say that Villa Senaia and its owner, Giuseppe, provides everything you could hope for. The villa shows an attention to detail that is very rare, and the host, along with his wife Laura, and young children Margherita and Matteo, give a warm, family welcome. If you cannot relax into the Tuscan way of life here, give up! Castiglion Fiorentino is no mega-star as a town, but has all the facilities you could ask for (including two great gelaterie and supermarkets!) and easy access for all the major centres one could wish to visit. We will be going again.